The real-time Engine is based on the single-thread Engine. 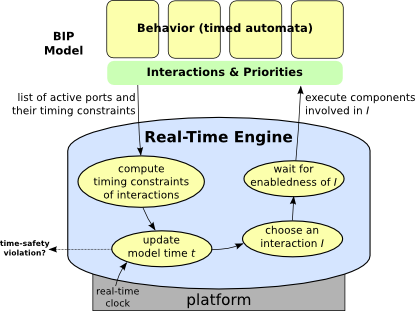 It allows using time features in BIP programs (clocks, time constraints, urgency types). simulation, exploration and interactive modes are similar to the ones of the single-thread Engine. They assume instantaneous execution of the code. real-time mode is used for a real-time execution of the model using the real-time platform clock. Installation instructions are similar to the installation instructions of the standard BIP compiler and runtimes.